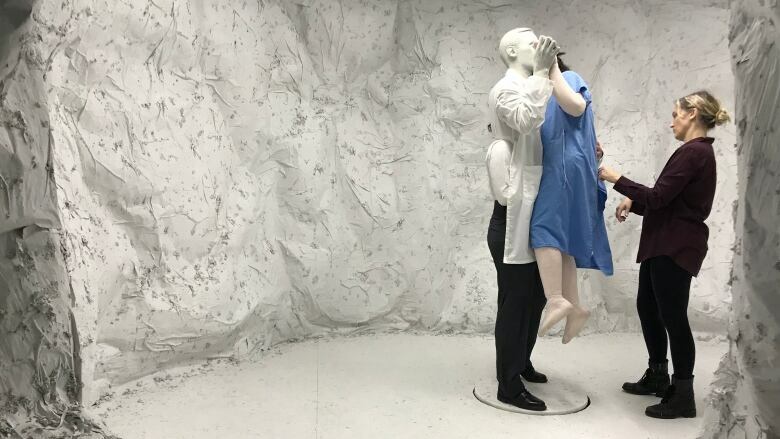 Wearing a costume that looks like a young man wearing a doctor's jacket in the 1950s, Sarah Anne Johnson dances slowly with a life-size doll wearing a hospital gown that's fallen open at the back. 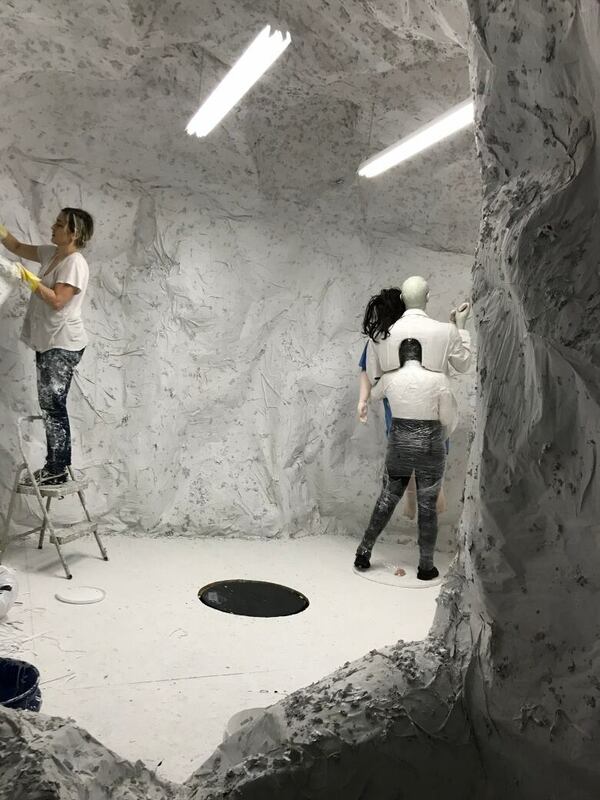 It's an art installation and performance piece called The Cave, part of an exhibition at the Julie Saul Gallery in New York. The doll represents Johnson's maternal grandmother, Velma Orlikow, the wife of former Winnipeg North MP David Orlikow. "I wanted people to feel empathy for her," the Winnipeg artist said. In the 1950s, Orlikow sought treatment for postpartum depression at Allan Memorial Institute in Montreal and unknowingly became a subject in the mind-control experiments of a CIA-funded American doctor. Patients were subjected to a series of mind-control experiments, including shock and drug therapies and induced prolonged sleep. Over the years, Johnson has turned that intergenerational trauma into art. "It's a very personal, individual perspective," she said. The gallery space for her show has been transformed into an enormous cave structure. 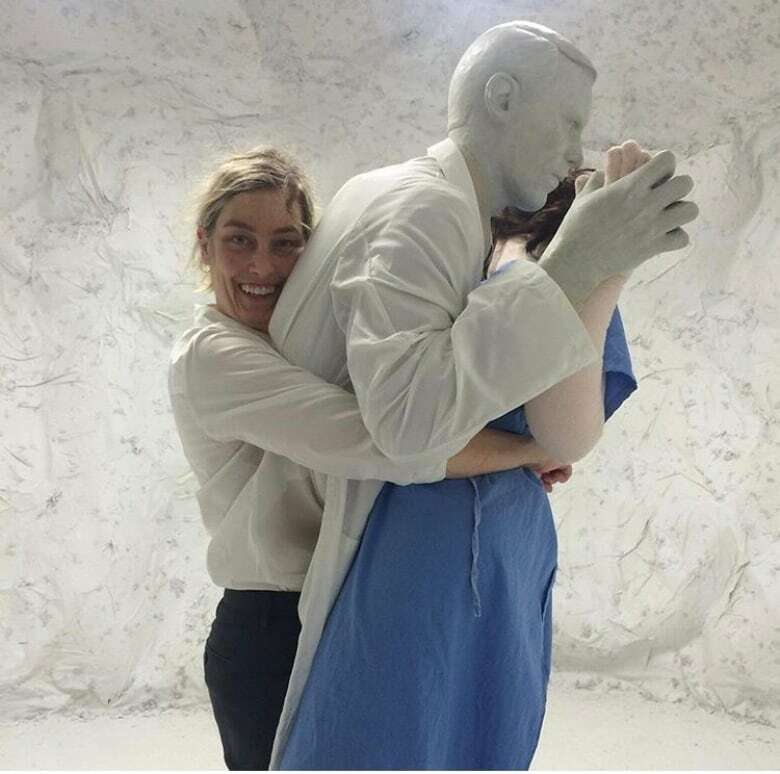 The Cave represents her grandmothers experience at the hospital and when Johnson's not performing, there's a series of three small porcelain sculptures depicting her grandmother and the doctor that eerily revolve on their bases. "I think of it as like a purgatory state, like it's this thing that happened that's frozen in time," Johnson said. She compares this experience to watching a movie about something traumatic. The movies always end with the victim feeling victorious, she said, like they won their battle, and that's when it ends and the audience leaves, also feeling the victory and a sense of resolve. "There was no resolve for my grandmother, I mean, she had brain damage. She was changed, her life was changed because of this thing that happened, and because of that, my mother had a very difficult childhood and these things get passed down," said Johnson. "So I don't want people to feel a sense of resolve when they leave." While The Cave does represent her family's experience, she doesn't think this piece is just about her and her family. "I don't want it to be just about me and my family, so I try and open it up so that [it's about] anybody who's had any experience with some kind of traumatic medical experience or … physical abuse in the mental health industry," she said. Putting her family's history out there is hard on her and her family, "so I don't do it all the time. I need to switch off from it," said Johnson. Her family hasn't seen The Cave and they probably won't, she said. "It's hard on them. They're very supportive, but when I do this work, it's hard on all of us." The experience of creating art that depicts her grandmother is getting stranger the older she gets, she said. "I was very close with my grandmother. She passed away when I was 14, and so very soon, I will have been making work about this for longer than I knew her." And she worries that because she's creating so much work about her grandmother, she's changing her real memories. "I wonder about replacing my memories of my grandmother with my art memories of her," she said. The Cave will be on display at the Julie Saul Gallery in New York from Nov. 8-24.